Leave it to a controversial title to make review accuracy questionable. 100% from critics on Rotten Tomatoes, 65% from audiences… something’s not kosher here. Scanning audience ratings for the show gives me lots of wordless 5-star entries and quite a number of wordless (or nearly so) 1-star and half-star opinions. Those that endeavor to say something beyond such a low rating invariably complain about racism. In other words, congratulations, Netflix, you elicited exactly the reaction you were looking for. Basically, it’s an ordinary show with good writing, social awareness, and a provocative title. Dear White People is a thing in the context of the show, a campus radio program whose host is Sam White. 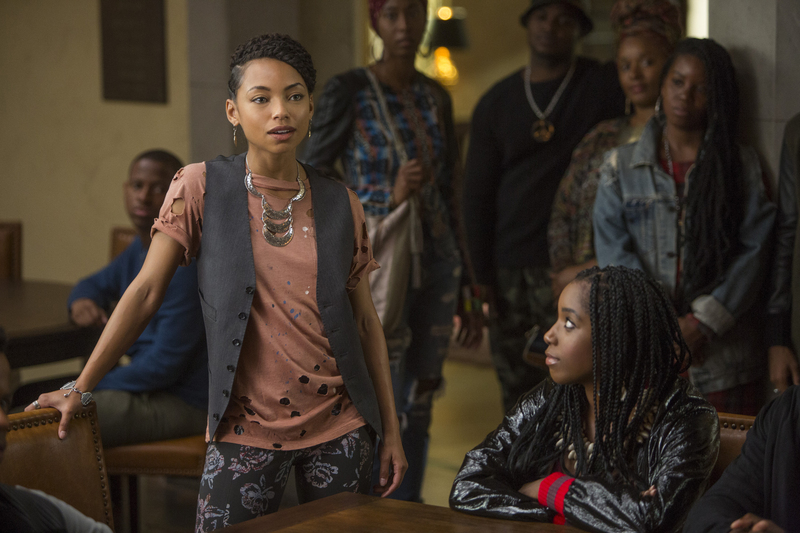 Light-skinned and mixed-race, Sam is at the forefront of Black Student Union activism and uses her show to highlight ways in which not just white students but also some of her black peers are promoting outdated and offensive attitudes and behaviors at the fictional Winchester University. When the campus’s satirical publication Pastiche plans a blackface party, the university administration steps in and tells them off in no uncertain terms. Somehow, the invitation gets sent regardless, and black students become aware and arrive to disrupt the offensive event. This kicks off a challenging couple of weeks for the university and its students, who have to come to terms with the fact that so many students elected to attend such an event and figure out what to do regarding the animosities stirred up by such a public stunt. The black students are not at all unanimous in their approaches – in addition to the “woke” members of the Black Student Union, there are also the pleasant but disengaged African American Student Union members (“I can’t believe racism is still a thing!”), the artsy and cultural Black American Forum, and the by-the-book part-of-the-system Coalition of Racial Equality – this last headed by aspiring student council president Troy Fairbanks, son of the university’s dean. Also in the mix is Lionel Green, a young black journalist at The Independent, a campus paper. Most episodes focus on matters from the perspective of a single student, oftentimes examining the same rough period of time around the blackface party before the second half of the show moves things forward. Sam and Lionel are arguably the show’s leads, but the narrative looks beyond them to bring other viewpoints to bear. Lionel is a gay black man opening up to his own identity; Troy is charismatic but feels his life’s a fraud, choreographed by a controlling father who wants to keep Troy away from “black mistakes.” His girlfriend Coco rubs elbows with the white sorority set, wears a wig to hide her natural hair, and dislikes her “ghetto name” Colandrea. Sam’s friend Reggie, who aspires to more than friendship, is an activist looking for the road to his cause, which he finds in Sam; his romantic rival is Gabe, a white student currently dating Sam who is sympathetic to the black students but locked out of the loop by Reggie’s resentment and his own life experience. The characters and the writing hold this show up. as does the decision to focus on a relatively narrow band of time rather than walking us through a whole semester or school year. Fairly cliché plot elements emerge with improved realism thanks to the show’s willingness to look beyond the surface in more ways than one. Sam is put in a bind because she has advocated for “not dating the oppressor” and has just been revealed as a hypocrite; she’s also revealed to be the actual instigator of the blackface party, having hacked the Pastiche Facebook account to send out the invites in order to provoke the resulting animosity. Coco, her former friend, resents Sam’s “light-skinned privilege,” arguing Sam tries harder to shout about blackness because she doesn’t live it as strongly as others. As a much darker-skinned woman, Coco doesn’t attract Reggie and is initially passed over by Troy in favor of Sam; she struggles to fit in with a black sorority that prefers Sam over her despite the former’s disinterest, and feels the truth behind the hollow social attentions of her white elite peers. Campus tensions escalate further when a security guard pulls a gun on a black student while demanding identification. This incident fuels the second half of the series, in which the various plot lines begin to collide at full speed: Troy is tapped to put a lid on black student protests so the administration can pander to white donors; Lionel gets to the bottom of what the administration is really after; Gabe and Sam’s relationship is tested by mistakes on both sides; and ultimately Sam is confronted by the fact that the firestorm she kicked off hasn’t done anything meaningful and that she’s been too zealous to accept other avenues of communication and change. “Dear White People,” the declaration that leads her radio program and the title of the show, becomes twisted into fighting words between her and Coco and ultimately proves to be the divisive and standoffish rhetoric that, ironically, kneejerk non-audience reactions considered it to be. Logan Browning and DeRon Horton are excellent picks to lead the cast, joining Brandon P. Bell as Troy and Marque Richardson as Reggie, the latter two returning from the original film. The show’s humor is a strong point, and it often makes excellent use of side characters to enrich the universe of Winchester. I do think there are more than a few subplots that end up feeling shoehorned in, and there are definitely other plot elements that feel like latecomers to the party when they come with the narrative heft to demand a bigger seat at the table. In particular, the administration’s scheme doesn’t even emerge until the penultimate episode, making the final showdown feel somewhat rushed. Nonetheless, I came away entertained. This is not the best show on television; as I said before, it’s socially aware, melodramatic, and full to the brim with love triangles and other classic soap opera tropes. Arguably, the lack of originality in these elements is part of the larger point – everyone just has lives, and if it weren’t for societal impositions of race and associated prejudices, there would be no meaningful difference between the lives of these university students and those. What we do have is a well-written, well-performed series with wit, humor, and the social insight to criticize and examine its own thesis. Provocative title notwithstanding, I think this is good TV and I’m looking forward to a second season. Glad to hear it! I had reservations about converting the excellent movie to a show, but it sounds as though they found meaningful ways to expand the premise and stake out new ground. It’s also good to see a meaningful critique of extremist tactics as employed the left – while I appreciated the film’s ardent anarchist sympathies (especially given how resistant we are to the reality that the Civil Rights movement was fueled by anarchist activists), the same point over the course of a numerous episodes might have been polemical. The reviewer score is interesting, and goes to the problem of review aggregators and RT in particular. The fact that 43 reviewers though it was decent does not translate to universal consensus of excellence. Even so, it will be taken as such; alternately, it will be seen as “left-wing media” and its conspiratorial conduct. Glurgh.